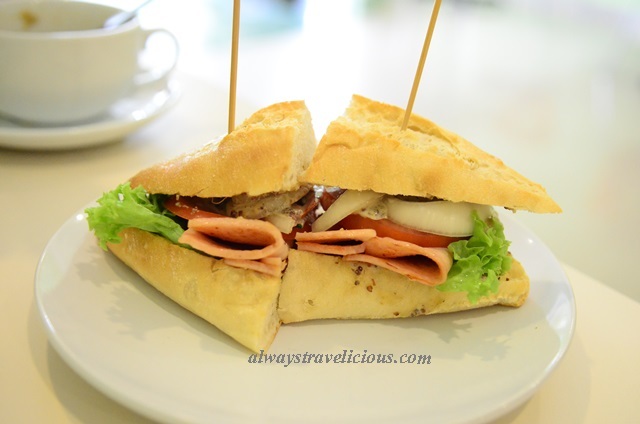 Basileuo Salad Cafe @ Ipoh (Greentown) - Always Travelicious ! We had lunch at Basileuo Salad in Greentown the other day and the simplistic cafe in green oozes fresh energy with a focus on healthy food. For starters, we had a flamboyant salad where we chose our very own 11 kinds of toppings including – beet root, enoki mushroom, tomato, carrot, pumpkin seed, wood ear fungus, edamame, pomelo, purple cabbage, black olives, chick peas with a raspberry vinaigrette dressing (RM 17.50). Of course if you don’t fancy too much greens you could always go for the basic one with 5 kinds of topping. The purplish dressing is light, giving the salad just a hint of raspberry that adds a subtle fruitiness to the salad. It’s not oily enough for a vinaigrette but the combo is so splendid that you won’t even notice the lack of oil. 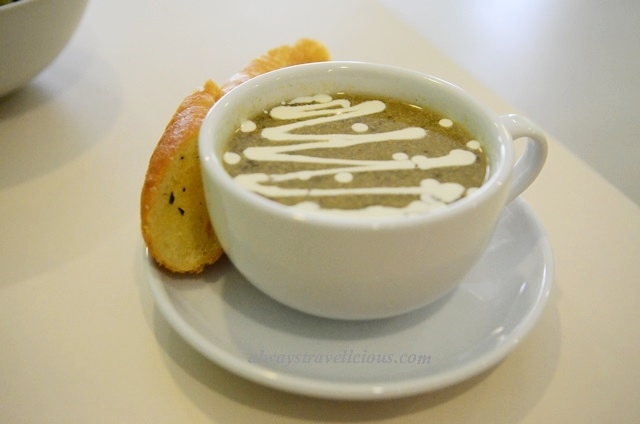 Broccoli soup looks a bit like mushroom soup because of its brownish color – which is the natural color of broccoli when it has been cooked long enough. It’s not fully sieved so you still feel the texture of the broccoli flowerets (RM 6). The smoked salmon on panini(RM 19.50) is a delightful surprise as it’s a bit of east meets west – with the happy marriage of shimeji mushrooms, eggs, salmon, scallion and a sprinkle of shrimp roe. It is the scallion in particular that consolidated overall flavor. The chicken ham knus has a spread of mustard sauce that’s subtly acidic and not sweet at all with the added texture from the grainy mustard seeds. Bread is enjoyably crisp and chewy (RM 9.80). Our drink is a healthy one too – the Korean aloe vera juice (RM 3). The next time you are opting for a healthy meal, you know where to go ! Opening Hours : Tues – Sun 11 am – 11 pm. It’s got a whole lot of goodies inside ! Everything looks so good. I wish I were there!